"Delightful start to a fun new mystery series." Gladdy Gold, an avid mystery reader, embarks upon a new career as a private detective when unexplained deaths occur at the Lanai Gardens retirement community where she resides. The evidence says death by old age, but Gladdy suspects foul play. When the local detective doesn't believe her, she organizes her eccentric friends into Gladdy's Gladiators. The Gladiators not only discover similarities between the deaths, they also uncover many real estate irregularities affecting Lanai Gardens. When they think they're finally on the trail of the real killer, someone else dies under suspicious circumstances and not in the same way as the others. Evidence now leads to one of the most trusted people at the retirement community. But Gladdy doesn't believe it and uses all of her mystery reading talents to find the real killer. This story is filled with fun characters and lots of humor. 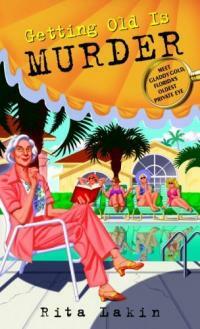 It's the first book in a new mystery series featuring Gladdy Gold, Florida's self-proclaimed oldest living private eye. I await the next book, GETTING OLD IS THE BEST REVENGE, with great anticipation. She�s not Miss Marple. Her friends are no Charlie�s Angels. Nevertheless, 75-year-old Gladdy Gold and her gang of eccentric Fort Lauderdale retirees are out, about, and hunting down a killer�one who is silently stalking them.